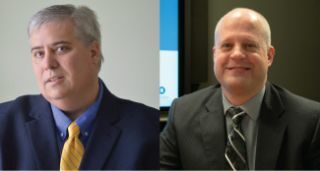 Chuck Neal (left) and Mike Young of Radiant TechnologyRadiant Technology recently added two regional sales managers to the its leadership team. Beginning January 2016, Mike Young will serve as regional sales manager for Radiant North and Chuck Neal will serve as the regional sales manager for Radiant South. Radiant has offices in four markets: Cleveland and Columbus, which make up Radiant North; and Cincinnati and Louisville, which make up Radiant South. The organization has seen steady growth during its 15 years in business. In recent years the pace of that growth has quickened, necessitating new leadership positions. Young and Neal will be the first ever regional managers for Radiant Technology.